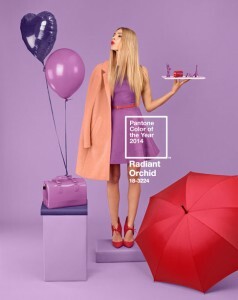 Just a reminder, as you may have forgotten, that at the end of last year Pantone declared the lively hue PANTONE 18-3224 Radiant Orchid the colour of the year for 2014. 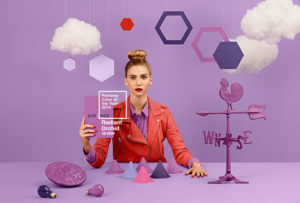 “An invitation to innovation, Radiant Orchid encourages expanded creativity and originality, which is increasingly valued in today’s society,” said Leatrice Eiseman, executive director of the Pantone Color Institute® when the announcement was made. It certainly is an exciting purple riot of a shade that seems to bloom with a rosy confidence that catches the eye and sparks the imagination. We are yet to see it in our clients’ work, though with spring wedding invitation season upon us, we could expect an email any day now with some trendy bride embracing the unique Radiant Orchid for her special day. For what it’s worth, we think it is a bit of fun and would love to see some punchy letterpress pass through our presses – like a fashion swingtag or nifty new business cards – that incorporate this playful colour. 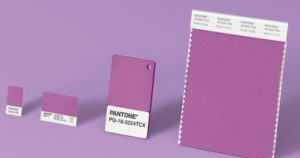 For more than a decade, Pantone’s Colour of the Year has influenced fashion, interior design, product packaging and graphic design. The folks at Pantone scour the earth for inspiration to select the shade of choice. Through the Pantone Color Institute, they chart future colour direction and study how colour influences human thought processes, emotions and physical reactions so that we can all be kept colour-savvy in our creative endeavours. Braille is not new but the tools and legalities around braille embossing have evolved in an exciting direction, but it’s exciting to share with you that Watermarx Graphics has the technology! A language of raised dots that was designed to help blind or partially blind people read, Braille was invented almost 200 years ago. Louis Braille created the system inspired by a military “night writing” code, in France in 1821. He had been blind since he was three. It is read by running fingertips over each character which represent letters of the alphabet and punctuation marks. In recent years the EU has mandated the inclusion of standardised braille on the packaging of pharmaceuticals, but the trend is spreading across the world. Have you noticed the increasing commonality of braille on household chemical products, CD covers, medicines, food packaging and signage, as well as countless random other things? This is not due to regulation, here in Australia, but the manufacturers’ sense of social responsibility to make their products more accessible to the visually impaired. It’s possible, though, that in the very near future, regulatory bodies here will follow the Europeans, and make braille compulsory on some things allowing more equal opportunity for the visually impaired. At Watermarx Graphics we work with a quick and inexpensive method of embossing that has achieved excellent Braille results for our clients. 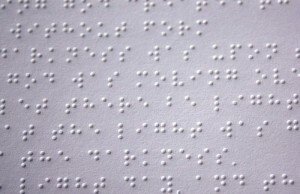 This means that we can help you can include Braille on your packaging and other specialty printing. For more information, get in touch! We would love to chat to you about including Braille embossing in your next packaging job. A white paper has been released in the print embellishment industry, which shows the positive impact of foil stamping on packaging. The research outlined in the paper showed that this embellishment – a specialty treatment which, as most of you well know, is a Watermarx Graphics speciality – attracts the eye of shopping consumers faster than plain packaging, and held their attention longer than items which did not have foil stamping as part of their packaging design but were otherwise identical packages. Earlier this year the Foil & Specialty Effects Association (FSEA) and International Association of Diecutting and Diemaking (IADD) held a joint conference in Milwaukee. During the conference, Dr. Andrew Hurley, a professor from the CUshop Consumer Experience Laboratory at Clemson University’s Sonoco Institute, released a white paper commissioned by the FSEA. The bling advantage is clear! Foil stamping increases visibility, stimulates attraction, holds attention and convey an image of value. In industry speak these kinds of embellishments are called “high-visibility enhancements”. The list of high-visibility enhancements incorporates several processes, including foil stamping, embossing and debossing. We are experts in these embellishments and can help you select your treatment at the design stage, so as to help you find an economical solution that will push your piece ahead of the competition. We recently printed the packaging piece shown in the picture for a high-end brand. 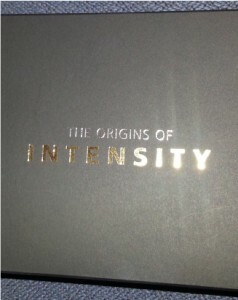 Using gold and silver foil on Ispira black from Spicers, we were able to achieve the dazzling effect of luxurious, metallic flashes. Everyone loves the glint of a bit of precious metal! Just another satisfied customer who, we hope and this new research tells us, is sure to have plenty of happy customers of their own.